Pine wood is not available for pellet mill directly. It needs to be grind into sawdust with the help of wood crusher. 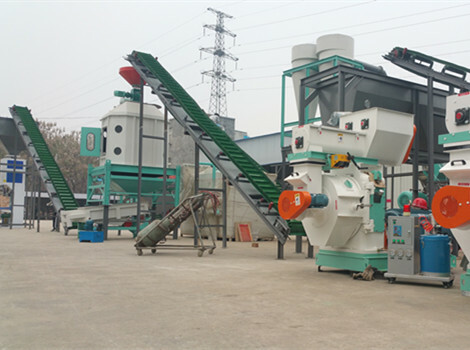 Our double-inlet wood crusher is the advanced equipment, obtaining the functions of single inlet wood crusher and wood hammer mill. The pine wood with the diameter of less than 50mm, can be fed into the larger inlet directly. Immediately, pine wood is smashed through the impact from high speed rotating hammers. The crushed wood sawdust will leak out from the sieve hole. For the relatively large wood, it needs to be chipped first. Feed the wood into the smaller inlet, wood will be chipped into small pieces by cutters. Then the chips are smashed into sawdust by high speed rotating hammers, and discharge from the sieve holes. Drying really plays an important and indispensable role in the production process of pine wood pellets. As a traditional drying machine, rotary drum dryer is an industrial drying machine dedicated to reduce or minimize the moisture content of pine wood sawdust. Our rotary sawdust dryer is made up of hot air stove and main rotary drum, which has high efficiency in drying the wood and biomass materials. Multiple-layered structure improves heat preservation effect in the drying cylinder and improves heat utilization. The rolling speed of drum is adjustable, assuring high precision gear transmission and smooth operation. The stove is in optimized design with new structure. Gas collection system is equipped to prevent flames into the drying drum. 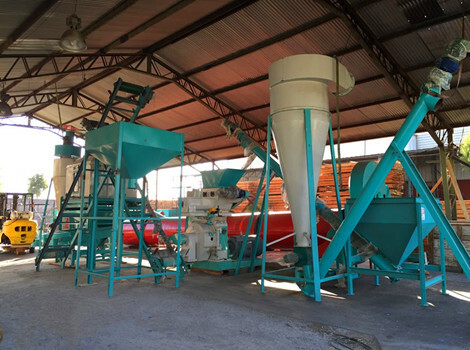 Pelletizing plays a crucial role in the whole pine wood pellet plant. MZLH 420 ring die pellet mill is the most suitable for compressing high density biomass materials. The ring die is made by international advanced technology, has long service life and strong wear resistance. The bearings and oil seal are imported with high quality, which ensures high efficiency, strong stability, and little noise running. The pelletizing chamber is equipped with suction cooling system. Frequency control motor is adopted for the forced feeder to ensure the quality of final pine wood pellets. Since ring die pellet mill has higher pressure, the pellets made by ring die pellet mill have larger density and smoother surface. After the pelletizing process, the temperature and moisture of pine wood pellets are high, then a pellet cooler is needed. Our counter flow pellet cooler adopts advanced counter flow cooling principle, preventing the cold air direct contact with hot pellet in case of the cracking of pellet surface. Latest octagon cooling bin design ensures even and sufficient cooling, and no cooling dead corner. The cooler is equipped with slide valve reciprocating type discharging device, ensures stable and reliable running and little residues. It adopts closed air entry system, enlarge the area of inlet air, ensure efficient cooling effect, avoid cross contamination. After cooling, the temperature of pellets is not 3-5℃ higher than room temperature, which is suitable for packing. After cooling, the packing process is necessary to protect the pine wood pellets from damp and dust. It has the advantage of high calculating precision, stable function, digital demonstration and easy operation.